Greater Phoenix is home to many of the nation’s finest resorts, including several Four Star and Five Diamond properties, as defined by the Forbes Travel Guide and the American Automobile Association, respectively. Multiple Greater Phoenix properties have earned AAA’s Five Diamond rating: The Phoenician Resort; The Canyon Suites at The Phoenician; The Fairmont Scottsdale Princess; and the Four Seasons Resort Scottsdale at Troon North. The AAA’s Four Diamond rating is held by thirty resorts in the Valley of the Sun. The Forbes Travel Guide awarded the coveted Five Star status to The Canyon Suites at the Phoenician and the Four Star status to four Greater Phoenix hotels: Four Seasons Resort Scottsdale at Troon North, The Phoenician, Royal Palms Resort, and Sanctuary on Camelback Mountain Resort and Spa. 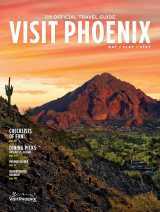 Forbes Travel Guide’s Recommended Hotel is Sheraton Grand at Wild Horse Pass. In terms of style and character, Greater Phoenix’s resorts span a broad spectrum. The most historic resorts date to 1929 (Arizona Biltmore, The Wigwam), while the newest was built in 2008 (Omni Scottsdale Resort & Spa at Montelucia). Aesthetic influences range from cowboy chic (Hermosa Inn) to mid-century modernism (Hotel Valley Ho) to Mediterranean romance (Royal Palms Resort) to Native American authenticity (Sheraton Grand at Wild Horse Pass). Some resorts cater to family fun with on-site water parks (Arizona Grand Resort, Pointe Hilton Squaw Peak Resort), while others are famous for their championship golf courses (Four Seasons Resort Scottsdale at Troon North, The Boulders, Fairmont Scottsdale Princess, We-Ko-Pa Resort and Conference Center). The historic Arizona Biltmore, a Waldorf-Astoria Resort has hosted every U.S. president since Herbert Hoover, and, ironically, Irving Berlin wrote “White Christmas” while sunbathing next to one of the resort’s pools. The JW Marriott’s Phoenix Desert Ridge Resort offers stunning desert views, family water options, and a concierge level. The 7-acre Oasis Water Park at Arizona Grand Resort features a wave pool, a tubing river, a 25-person hot tub, and an 8-story tower with three water slides. The Boulders Resort & Spa, a Curio Collection by Hilton offers its guests rock-climbing clinics and nature-photography instruction amid the 12-billion-year-old boulders after which the resort is named. At The Canyon Suites at The Phoenician, guests can explore Old Town Scottsdale in a chauffeured Mercedes, or relax in their rooms playing a Martin Guitar from the front desk. The JW Marriott’s Camelback Inn is one of only three hotels in the United States to earn AAA’s Five Diamond status 34 consecutive years, since the awards’ inception in 1977. Fairmont Scottsdale Princess annually plays host to the Waste Management Phoenix Open, the best-attended event on the PGA Tour. A professional astronomer leads complimentary stargazing talks under the Sonoran Desert sky weekly at Four Seasons Resort Scottsdale at Troon North. The Hermosa Inn is the former guest ranch and studio of cowboy artist Alonzo “Lon” Megargee, whose painting “The Last Drop From His Stetson” adorns the inside of the Stetson Company’s premium cowboy hats. The Hotel Valley Ho hosted the private wedding reception of Robert Wagner and Natalie Wood in 1957. The structure that houses Hole-in-the-Wall at Pointe Hilton Squaw Peak Resort was built by hand in the 1940s and known as the Cactus Rock Lodge, a 14-room hotel and dude ranch. Sheraton Grand at Wild Horse Pass employs a Cultural Concierge who is available to educate guests about the history and traditions of Pima and Maricopa tribes. Each evening at the Westin Kierland Resort and Spa, Scottish bagpipes usher in the sunset in an homage to Scottish immigrants’ contributions to Arizona&apos;s railroads, mines and towns. The Wigwam was formerly a cotton farm and winter retreat for executives from the Goodyear Tire & Rubber Company. The Hyatt Regency Scottsdale Resort and Spa at Gainey Ranch offers a French Celtic mineral pool at Spa Avania as well as nightly gondola rides with a singing balladeer.